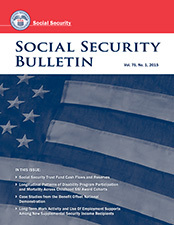 This article examines the Social Security trust fund reserves and cash flows and their interrelationships with the Treasury's cash management operations and the budget of the rest of the federal government. The article considers the extent to which the trust fund reserves and interest income reflect cash transactions between the trust funds and the public and are not, as some commenters have asserted, just accounting fictions. It also considers whether, under the Social Security system's self-financing framework, an improvement in trust fund finances can help relieve the accumulated debt commitments of the rest of the federal government.